Luxury Apartments is a great choice for true connoisseurs of beauty and chic in real estate website templates. This Joomla 3.8.x template will help to make your website really luxurious. You don't find there nothing superfluous, only carefully designed layouts with restrained colors, classic and refined style and exquisite fonts. Responsive design make it suitable for major mobile devices and tablets, so your real estate website will be mobile-friendly and look great on different screen sizes. Luxury Apartments Joomla template is compatible with the following browsers IE 9+, Firefox, Safari and Chrome. Real Estate Manager component PRO, provides powerful functionality and ample opportunities for creating the best real estate listing website. There are all necessary layouts to create real estate website like all categories, single category, all properties with three different views - grid, list of map layout, my properties (for creating frontend admininstrator panel), frontend property submission form, forms for rent and sale properties, contact form with agent. Apart from Real Estate Manager component, Luxury Apartments Joomla template is enhanced with modules and plugins for REM. Thus, in template there are functionality for displaying featured houses, search properties by a range of criterias, location map functionality (integration with Google Maps) and much more. 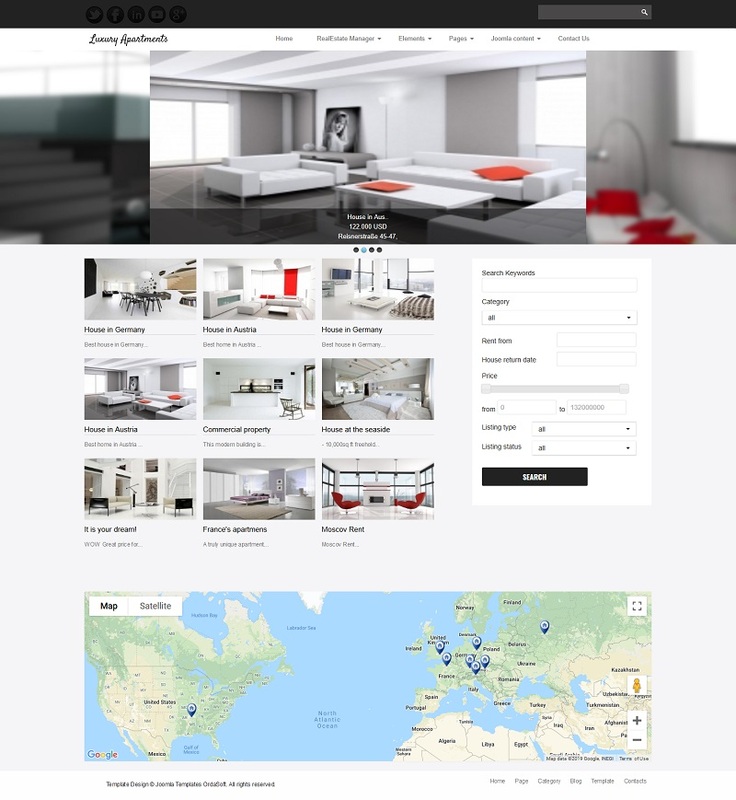 With OS Joomla Blank Template that comes as a part of Luxury Apartments, you'll be able to control style of links, body color, body pattern, choose suitable Google font, insert tracking Google code and your own copyright. Get this beautiful real estate website template or grab the entire collection of 20+ ready-to-use and responsive real estate Joomla templates in Standart membership plan. Plenty of module positionsDue to Joomla Blank template, Luxury Apartments comes with a wealth of module positions to place your content exactly where you want it. Cross-Browser CompatibilityLuxury Apartments Joomla template fully compatible with all browsers: Chrome, Firefox, Safari, Opera and Internet Explorer 9+.